Lisk Highlights Weekly roundup March 15th 2019. Lisk Staunch Supporter is Back with a Positive Message. Now Kyle has popped up again with a video titled “Buy Lisk… and wait for it” where he is extremely bullish on the token. Some choice quotes from the video include…… “I have two words, buy lisk”….. “Look at that chart its a beauty” …… Lisk is always a lagger, the last to go…… “No downward mining pressure, no downward selling pressure from delegates selling”. He ends the video with “so buy Lisk and wait.” He has included a warning of course in the subtitle of the video where he says “Disclaimer: I am not your financial advisor. Do your own research. Scale in. Scale out.” If you would like to watch the video and make up your own mind on what this OG Lisker has to say, then you can find it below. In the week following the upload of this video the LSK token price hits a 3 month high on exchanges. Lisk HQ to host a Berlin Blockchain Week Breakfast. Meet the Developers & Science Team. Lisk Development Tools with Rachel Black — Tech Evangelist. Lisk Sidechain Project has Now Achieved Machine learning on Chain. 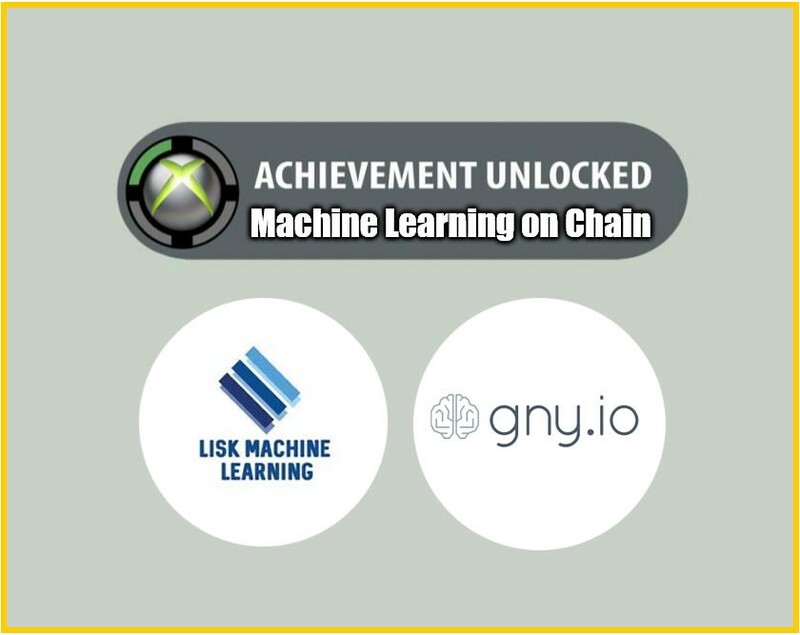 Chief R&D Officer and Co-founder of GNY (bringing Machine Learning to Lisk), Richard Jarritt informed the project’s followers on the GNY telegram that a major milestone has been reached this week. Thomas Lorenc, Chief Technology Officer / Lead Data Scientist on the project has been testing the blockchain with the GNY Machine Learning algorithm running inside; proving without a doubt its compatibility within the projects design framework. Achievement unlocked! The team are now working on improving the systems predictive accuracy and getting familiar with the system they have built. The GNY Github is due to go live by the end of this month, following an important GNY staff conference in London. After the conference a report in blog format will be released to lay out what the team covered, and to provide an outlook for the rest of the years development. Lisk working with Weg Bank; what we know. In a Youtube live stream on Mar 11, 2019 between Litecoin Founder, Charlie Lee, and TokenPay CEO, Derek Capo, a piece of info was released that has many Liskers really excited. 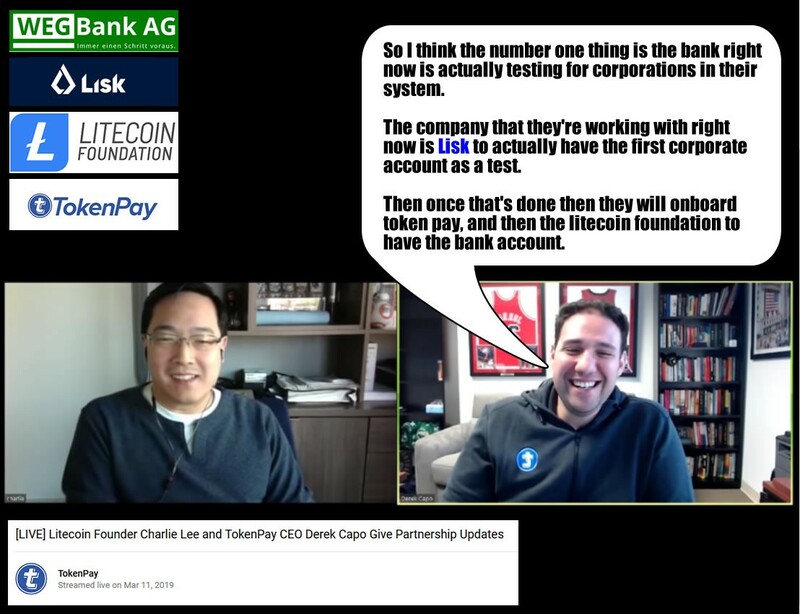 The live stream was on the official TokenPay youtube channel and titled “Litecoin Founder Charlie Lee and TokenPay CEO Derek Capo Give Partnership Updates”. What I present to you today is a transcript of the comments made by Derek Capo relating to Lisk and the bank to allow you make your own assumptions as to what it could mean for the Lisk project. First up though a little background info on the main players in this situation. In the Litecoin Foundation’s own words…..
WEG Bank is a specialized credit institution providing banking products to housing industry: current and deposit accounts, financing for construction and renovation projects. It also provides card facilities and Internet banking services. Its total assets in 2017 sat at 53.58 million EUR. The company is based in Ottobrunn, Germany. In Q2 2018 Tokenpay officially closed a deal with WEG Bank AG, located in Germany. WEG Bank also made an announcement of the partnership on its website. Share certificates representing 9.9% of the equity interest in WEG Bank AG were transferred to TokenPay Swiss AG, along with options to acquire an additional 80.1% of the bank upon customary regulatory approval. This move came due to WEG bank having an interest in offering FinTech solutions that will align itself with the new economy, while at the same time continuing to service its existing real estate client base in a traditional fashion. To the best of my knowledge this 9.9% of the equity interest in WEG Bank was then transferred from TokenPay to the Litecoin Foundation in July of 2018. The Litecoin/TokenPay strategic partnership over WEG Bank is supposed to see Litecoin tasked with providing high-level blockchain mechanization facilities, while TokenPay focuses on marketing, and putting in place a logistics partner. Now to the transcript that I will leave you with. I transcribed it from the livestream which I have also timestamped for you HERE. All speech is from Derek Capo and directed at Charlie Lee. “The good news is that the government has actually been pretty pretty open to it, and listening, let’s put it that way. And the CEO has done an amazing job of basically contacting them every day, letting him know because it’s a business at the end of the day, right. Another thing that I’d like to mention is that the bank is not only integrating their services because they have like a few things that they want to do. They’re not only integrating it for themselves. So WEG bank is a very small bank, lets be very clear about that, okay. I think a lot of people don’t understand that when you’re a small bank you don’t actually build a lot of tech infrastructure because it costs a ton of money, right, so what they did is they’re using a company that basically provides infrastructure like if you want to do online banking instead of building your own online banking platform from scratch, you basically use theirs. You change the name, you label it, maybe you change the front the front end, but the whole back-end system accounting all that stuff is from them.